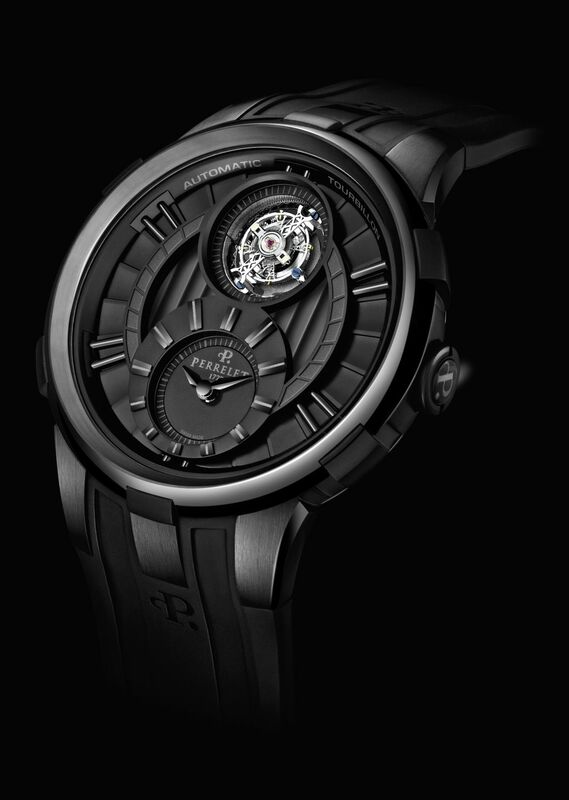 The new All Black Tourbillon Automatic model by Perrelet reveals its ingenious mechanism, a gem of the horological art, through an open window at 12 o’clock. Silver-toned and enhanced with several color accents, it stands out to its best advantage as it majestically ticks off the seconds. Providing an elegant counterpoint at 6 o’clock, the applied hours and minutes are displayed on a black surface that merges seamlessly into the finely fashioned dial structure. In the center, the raised Côtes de Genève motif creates a shutter-like pattern making a fascinating contrast with the surround composed of overlapping geometrical elements. The latter are reminiscent of the characteristic blade tips of the Turbine collection, a spectacular expression of the Double Rotor that has become a Perrelet signature. Spread over the entire watch, ththe black shade reinforces its resolutely high-tech character, further accentuating the bold nature of the most generously sized of all the Perrelet cases, made in this instance in DLC-coated steel. Endowed with a 50 mm diameter, it features a middle on which the distinctive grooves are widely spaced. The bezel is straddled by various elements adding a sense of volume, while the lugs contribute to the sense of power enhanced by central reinforcements consolidating the secure hold of the rubber strap. The new model is equipped with self winding Perrelet Caliber P-311, endowed with a 65-hour power reserve, and may be admired through a transparent caseback. As usual in the brand’s creations, it is personalized by an exclusive rotor. Strap: black rubber with DLC-coated steel pin buckle.